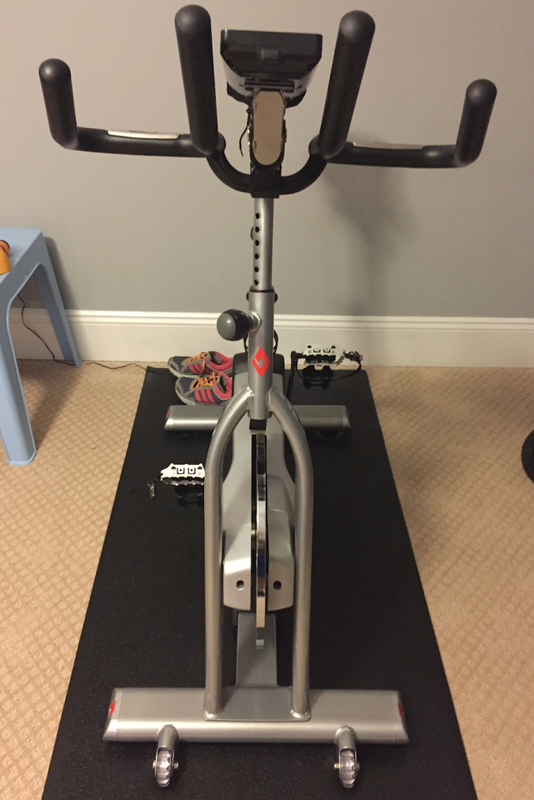 I recently purchased the Diamondback Fitness 510Ic exercise bike and I wanted to use it for awhile before I posted a review. Well, I’ve owned it for awhile now and felt it was time to share my experience thus far. I did a lot of research before I purchased the 510Ic and I felt confident in my decision. Am I still happy with the decision I made to purchase this bike? Or did this whole endeavor turn out to be a big waste of time and money? Spoiler alert, I made the right call. Diamondback has been in the road bike business for about 40 years. The company is based in the USA, but their bikes can be found all over the world. Diamondback took their expertise in road bikes and started applying it to exercise bikes around 10 years ago. The company also produces ellipticals, treadmills, and rowers. The company prides itself in making high-quality exercise machines at a reasonable price. They are also known for their impressive warranties and customer service. I will spend more time on these down below. Diamondback Fitness, and the 510Ic Indoor Cycle specifically, have won several “Best Buy” awards from various magazines. The 510Ic finds itself on most fitness bloggers’ “Best Of” lists. It’s also considered one of the most popular indoor cycles on the market. Long story short, this bike is considered by most to be one of the top home exercise bikes on the market today. Ok, let’s get to the good stuff. I mentioned that I have owned the 510Ic for awhile now. I’ve been using it about 3x/week, so I feel I have enough experience with the product to give an educated review. I did a lot of research before I made this purchase. I mean, come on, of course I did. What kind of fitness blogger would I be if I didn’t do my homework? 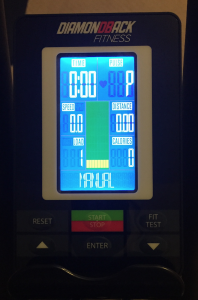 Like many of you, I read reviews, compared warranties, checked weight capacities, learned about available programs, and compared probably 10 or so different indoor cycles before deciding on this particular exercise bike. Why did I choose the 510Ic? First of all, this bike is very well reviewed. Users ratings are generally very high. I was drawn to how heavy duty the frame was and the fact that it has a display console with preprogrammed workouts. Many spin bikes don’t, especially in this price range. Assembly for the 510Ic was pretty straightforward. The biggest problem I had was that I was alone at the time. Well, not exactly alone, I did have my 3 year old son with me. For those of you who have kids, you know exactly how much help he was. I had to get the bike up to the attic and it comes in a very large, very heavy box. So, I opened it up and took the bike up to the attic piece by piece. I got a workout in the meantime. There really aren’t that many pieces. The flywheel assembly was the heaviest piece. It took me an hour or so to assemble. The instructions are fairly straightforward and easy to follow. It comes with all of the tools you need during assembly. With another adult, it would have been easy, but I was able to manage by myself. The most difficult part was snaking the wiring through the handlebar frame and attaching the console (and even that wasn’t that bad). As you put this bike together, you will realize how heavy-duty this bike actually is. The entire frame is made out of a thick steel tubing. I love how sturdy it is when I’m riding. It has the feel of a commercial grade spin bike. I’m 6’1″ and almost 200 lb and the 510Ic has more resistance than I need. It has 16 different levels, and so far, I haven’t been beyond level 12. It offers plenty of resistance to stand up on to work those hills. The electronic resistance control is great, you can easily adjust the resistance with a simple push of a button. The 32 lb flywheel provides a very smooth, quiet ride. The magnetic resistance is almost completely silent. I can easily ride this bike and watch tv at the same time. More importantly, I can ride the 510Ic upstairs in my attic early in the morning without waking up the rest of my family. My wife says she can always hear me when I am lifting weights upstairs (even though I tip toe around), but she never knows when I’m riding. The fact that the 510Ic is a spin bike and offers a console was a big “pro” for me. I wanted to control the resistance electronically and I wanted workout programs. The console provided here is nothing fancy, but it gets the job done. It’s pretty self explanatory to use and it turns on automatically when you start pedaling. The display screen is pretty simple, again nothing too sophisticated, but effective. The readouts are fairly large and easy to see during use. I like that it has a little bar graph depicting the intensity of your resistance. This exercise bike needs to be plugged in to operate, so just make sure you have an outlet available wherever you are planning and putting it if you get one. The cord is fairly long. The 510Ic offers 12 different workouts, I’ve used about 4 of them so far. There are various hill workouts and they are identified with names like “beginner” or “sporty”. There are also some heart rate programs that I haven’t tried yet. There is plenty of variety offered through the workouts, but I often find myself making my own workouts on the manual setting. Indoor cycles aren’t well known for their comfort, and the Diamondback 510Ic isn’t an exception. The seat isn’t very comfortable. 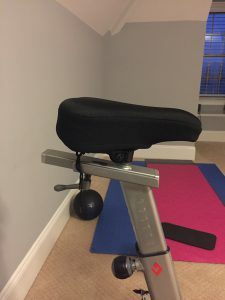 This exercise bike comes with a standard bicycle seat, and I don’t find bike seats very comfortable either. If you are an avid rider, this will feel completely normal for you. But I find myself constantly shifting to find a comfortable position. I actually had to give in and purchase a seat cushion after a couple of weeks, that significantly helped. I like all of the handlebar positions, gives you plenty of options for hand grip during use. The handlebars are padded, which improves comfort. The pedals are also nice, no issues with comfort there. Overall, I would say the Diamondback 510Ic is pretty standard in terms of comfort. No more, no less. Spin bikes aren’t very comfortable, that’s just the way it is. Ok, I wanted to make sure I gave a shout out to the Diamondback Fitness customer service because I did have a little situation with my bike. After about a month of use, I noticed the right pedal felt a little off. At first, I thought the buckle from the pedal was rubbing against the frame. I could adjust my foot position in the pedal and it would feel ok again. After awhile, that stopped working. I still couldn’t figure out what was going on… until one morning I stood up to start a hill and the right pedal popped off the crank arm. Turns out the pedal had been loosening up (is that a word) and had unscrewed itself from the crank arm. Looking back, I should have discovered this before the pedal came off. That said, I’m not sure why it happened in the first place because I know I installed it correctly (the right pedal is screwed in clockwise, the left pedal counter-clockwise, fyi). If I had discovered it, I could have re-tightened and been fine (unless there was truly a fault in the crank arm). I tried to reinstall the pedal, but when the pedal popped out it stripped the thread on the crank arm. I couldn’t get the pedal back on. Frustrated, I decided to email Diamondback Fitness’s customer service and explain my situation. I was pleasantly surprised. Expecting a drawn-out battle of proving my purchase and multiple emails trying to explain my problem in the first place, I was pleased to correspond with a very friendly customer service agent by the name of Emily. She understood my problem immediately and was happy to send me a pair of replacement crank arms free of charge. All she needed from me was my address and the serial number from the bike. About a week later the replacement part came and I was able to switch the crank arm out pretty easily (I had to purchase a crank puller for about $14). My 510Ic is back in action and working great again. Long story short, I was very pleased with my interaction with the Diamondback customer service team. They were easy to work with and more than willing to solve my problem. There was no tedious battle trying to prove when I purchased the bike either. I got a little nervous when I realized that I had not filled out the warranty card, but it wasn’t an issue. Even with the little hiccup of my pedal coming off, I am very happy with the Diamondback 510Ic exercise bike. I’m not a serious cyclist by any means, but this bike feels stable during use and I can easily stand up on it on hills without the frame shaking or wobbling. Even though the pedal coming off could have been my fault (after all I’m the one that assembled it), customer service didn’t question me at all, they simply sent me the replacement part I needed, no questions asked. The 510Ic is very quiet during operation. I can easily workout early in the morning in my attic gym without waking up my wife or kids. I can comfortably watch tv or listen to music while riding. I also love how smooth this bike is to ride. The combination of heavy flywheel and magnetic resistance makes for a very comfortable experience. The workout programs are fine, more than enough variety for my needs. I haven’t tried all of them yet. I like to make up my own workouts while I ride, changing the resistance manually. The seat isn’t very comfortable, but you can’t really hold that against the 510Ic… no spin bike seats are comfortable. It was easy enough for me to improve comfort with a cheap gel seat cushion. The grip heart rate monitor in the handlebars seems to work pretty well. I use it a little here and there, it picks up your rate pretty quickly. I haven’t tried the heart rate workouts yet. Overall, this is a very nice exercise bike for your home. It’s heavy, but the transport wheels in the front work very well, one person can easily roll it into position. If you are looking for a heavy-duty indoor cycle that can give you the feel of a commercial grade bike, the Diamondback Fitness 510Ic is a great choice. I wanted to update this review now that I have had my 510Ic for about 6 months now. I’m happy to say that I am still using it! I’m averaging between 3-4x/wk. Long story short I still love it. Since I replaced the pedal, I have had no issues whatsoever. The replaced pedal works great, I’m not sure what happened with that pedal to begin with. I’ll be honest, I have second guessed myself- did I install it incorrectly to begin with? Maybe, but I’m not really sure how since it can really only screw on in one direction. Regardless, the pedal works fine now. The bike is still operating at 100%. It is very quiet, no squeaking or unwanted noises. I can watch tv comfortably while I exercise. Overall, I’m still very happy with the 510Ic and am still happy with my purchase. Hopefully that won’t change in the next 6 months.